Rossi Cyclops-- Model: R97206 Caliber: .357 MAG Capacity: 6 SHOT Action: DOUBLE ACTION Barrel Length: 6" Total Length: 10.5" Grips: RUBBER GRIPS Weight: 35 oz Frame Size: MEDIUM Front Sight: FIXED Rear Sight: ADJUSTABLE Finish: STAINLESS STEEL Rate of Twist: 1:16.5" In December of 1997 BrazTech International L.C. was created as the exclusive importer of Rossi firearms in North America. Previously, Rossi firearms were distributed by Interarms of Alexandria, Virginia. Rossi manufactures its classic rifles in a plant in Sa Leopoldo, Brazil and will continue operations there, selling many firearms outside the United States and North America. 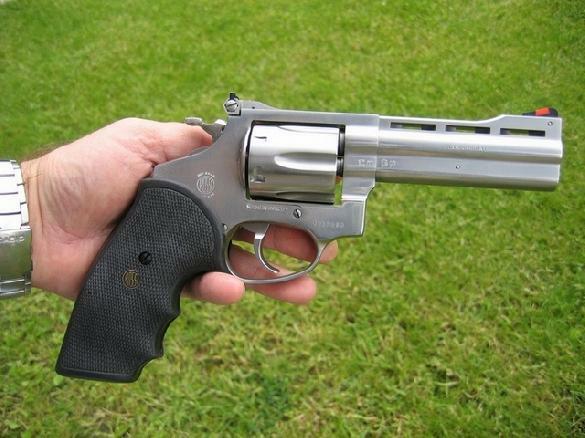 At the same time, Forjas Taurus, S.A. purchased the rights and the equipment to manufacture Rossi handguns. Taurus manufactures three models of .38 Special revolvers and four models of .357 Magnum revolvers under contract with Rossi. Revolvers sold by BrazTech with the Rossi name are manufactured in a brand new facility owned by Taurus in SaoLeopoldo, Brazil. Much of the tooling and many of the machines were acquired from Rossi during negotiations between the companies. Today's Rossi is still run by the same family and they put the same dedication and innovation into every firearm. At Rossi, it is more than just building guns...it is a family's history and tradition.